Large tree, up to about 60 m tall; mature trees generally fluted and buttressed at the base; branches tend to spread, or droop slightly and then upturn; the branchlets spray-like, strongly flattened horizontally; bark ridged and fissured, readily tearing off in long thin strips; wood aromatic; growing 'tip' (leader) drooping. Scalelike, somewhat overlapping, closely pressed to stem, in opposite pairs; glossy yellowish-green, turning brown and shedding with age. Seed cones green when immature, brown, egg-shaped, and 8-10 mm long when mature; pollen cones minute and reddish, numerous. This is the provincial tree of BC. A shade-tolerant to shade-tolerant/intolerant, submontane to subalpine, Western North American evergreen conifer distributed more in the Pacific than the Cordilleran region. Occurs predominantly in cool temperate and cool mesothermal climates; its occurrence decreases with increasing latitude, elevation, and continentality. One of the most common trees in central and southern B. C.; often forms pure stands on floodplains and wetland sites. 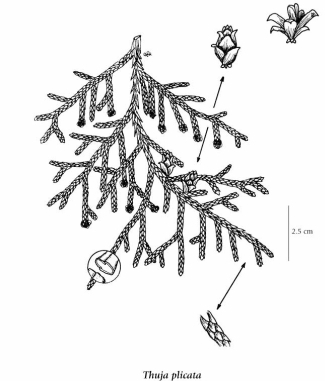 As does yellow-cedar, western redcedar tolerates a nearly complete edaphic range, and develops a very dense root system: the latter feature may explain its abundance on very steep, seepage-affected, and often unstable colluvial soils. Most productive on submontane, fresh to moist, nutrient-rich soils within cool mesothermal climates. Characteristic of cool temperate and mesothermal forests.